Oklahoma Connection | Frates came with her parents to Oklahoma City, Oklahoma, at the age of two. Mex Frates was one of five Oklahomans selected by the Oklahoma Health Center Foundation to receive its 2004 Living Treasure award. Regarded as the “Grande Dame” of arts and civic volunteerism, Mex Rodman Frates was born in Illinois and moved to Oklahoma City with her parents when she was just three years old. 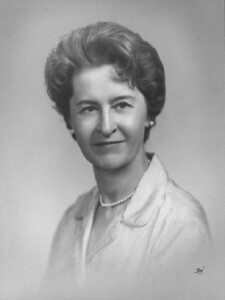 She graduated with honors as a Phi Beta Kappa from the University of Oklahoma, where she also received the first Letzeiser Medal and the Dads Day Cup as Outstanding Senior Woman. She was the only female member of the Committee on Community and War Fund Drives in 1941; the first woman to receive the Conference of Christians and Jews Award in 1974; and was the first female chair of the Board of Advisors of Mercy Hospital in Oklahoma City. A past president of the Junior League, she was chair of the Art Center Drive and Symphony Drive and received the second annual Leadership in Education Award from the Oklahoma City Public Schools Foundation. A dedicated philanthropist, Mrs. Frates married Clifford L. Frates, president of C.L. Frates & Co., in 1935.